This is an experiment that’s been brewing in my head for a while. 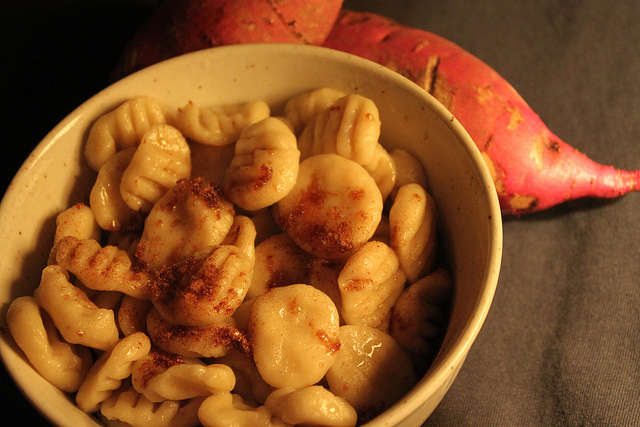 I don’t know what made me think of it, but I wanted to make a dessert gnocchi using Korean sweet potatoes. The reason was I don’t like bahm goguma 밤고구마, the “chestnut” style sweet potatoes. Unlike the orange hobak goguma (pumpkin sweet potatoes), bahm goguma have light starchy dry flesh that I need a gallon of milk to chase down. But because of this starchiness, I felt it was a prime candidate for gnocchi. Keeping with the journal aspect of this site, this is what I did, and I’ll note what I would do differently next time. I boiled three sweet potatoes until they were tender. Just poke them with a chopstick to see when they’re ready. I shocked them in cold water to make the skins come off easier and peeled them. EJ snagged a bite. Again, these are the chestnut variety of sweet potatoes. That’s why they’re whitish. And smashed them through with my big wooden pounder. This was the first time I tried anything like this, and it actually worked. I’ll make mashed potatoes this way from now on. It does beef up your arm a bit. This was the end result. Throw in some butter and cream, and we’d have a nice side dish. But for gnocchi, I put in 2 1/2 cups of cake flour, a pinch of salt and an egg. I then shaped it into a ball. And kneaded it a bit. Not too much. I took a piece and rolled it out like a snake. This is where that pre-school training comes in handy. Cut them into pieces with a knife. EJ convinced me to make them bigger after this batch. She helped me by scoring them with a fork. They looked like white beondaeggi. I cooked them in salted boiling water until they were blurry floating. Then scooped them out. In another pot I melted a stick of butter with around three tablespoons of dark brown sugar. The taste was heavenly! I tossed the gnocchi in the butter and sprinkled a little more brown sugar and a few dashes of cinnamon. I could taste the sweet potato in the gnocchi, but it wasn’t immediately evident. Next time, I’ll mix a tablespoon of sugar with the egg and add it, along with some more salt. Maybe garnish the end product with some apples or more sweet potatoes. Even though I can think of improvements, it turned out pretty darn good. This made a lot of gnocchi. Make sure you have a child around to help you. We brought a bowl downstairs to our neighbor. Boil the sweet potatoes until tender and then shock them in cold water. Push the sweet potatoes through a strainer or ricer. Add flour and salt and combine. Mix sugar with egg and add to dough. Mix. Put on a counter and knead for less than five minutes. Just until it comes together. Take off a piece of dough and roll it into a snake. Press with a fork. Repeat until the dough is all used up. Put the gnocchi in boiling water until they float. Remove and strain. Melt the butter in a separate pot over low heat with the brown sugar. Whisk until incorporated and bubbling. Turn off the heat. Toss the gnocchi with the butter mixture. Garnish with sprinklings of brown sugar, cinnamon, sweet potato or apple and serve hot. Our local Italian place made some gnocchi with the obak goguma (pumpkin sweet potatoes) and tossed it with a gorgonzola cream sauce! So delicious! I’ll have to try yours as well! It looks like a lot of work for me. I think I would just hit a restaurant and buy me some. I like your concept, but I think there are somethings where I Would do things differently. 2 1/2 cups of flour might be too a little too much for 3 potatoes. You want to be super stingy with your flour, just enough so it barely comes together. I recently tried cooking my sweet potatoes in milk instead of salted water, and it worked out really really well. Plus you can use the milk when making the dough. And it’s already heated for you too! Boiling water is too vigorous for gentle gnocchi, just simmering is a lot better. The proper technique for making those indentations on the gnocchi are to place the fork upside down on a table, and slowly rolling the gnocchi over it, so you still keep the intial pillow shape intact. Gnocchi is typically made with brown butter, which may go better with the brown sugar. I think the brown sugar as garnish looks a little clunky, powdered sugar might be better. Thanks Sohi! Lots of great advice. Students and workers can find alternatives to unhealthy vending machine snacks through companies like Fresh Healthy Vending. Fresh Healthy Vending uses a three prong approach to snack foods to make them nutritional, tasty and affordable.